A really good book exploring past and present uses of the 35 species of British native trees. I was amazed at some of the uses that trees have been, and are, put to. British native trees - their past and present uses also includes a guide to burning wood in the home and so is of particular interest to Stovesonline.co.uk visitors. 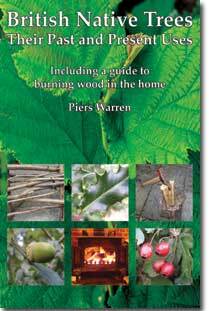 It is very accessibly written by tree surgeon and smallholder Piers Warren. The book would be especially interesting to people interested in British history and heritage, people interested in trees, and people who heat their homes using wood. The genus by genus breakdown of British trees is also useful from an identification point of view as there are pictures showing what the leaves of each tree look like making this an excellent book to take on a forest walk. Find a native tree, flip through until you find the right leaf and you have the name of the tree, what the tree is historically used for, what uses it is put to today as well as potential future uses. As the title suggests this book includes a genus by genus breakdown of the past and present uses of the 35 British native trees. The history and practice of charcoal production. An exploration of the environmental issues involved in burning wood in the home. Foolproof guide to building the one-match-fire. British Native Trees - Their Past and Present Uses is Published by Wildeye 2006. Available through Wildeye as a Paperback for £5.95, or eBook for £3.95. Visit the Wildeye website for more information and to order a copy of British native trees - their past and present uses.